Celestial navigation, also known as astronavigation, is the ancient science of position fixing that enables a navigator to transition through a space without having to rely on estimated calculations, or dead reckoning, to know their position. Celestial navigation uses "sights," or angular measurements taken between a celestial body (the sun, the moon, a planet or a star) and the visible horizon. The sun is most commonly used, but navigators can also use the moon, a planet, Polaris, or one of 57 other navigational stars whose coordinates are tabulated in the nautical almanac and air almanacs. Celestial navigation is the use of angular measurements (sights) between celestial bodies and the visible horizon to locate one's position on the globe, on land as well as at sea. At a given time, any celestial body is located directly over one point on the Earth's surface. The latitude and longitude of that point is known as the celestial body’s geographic position (GP), the location of which can be determined from tables in the Nautical or Air Almanac for that year. The measured angle between the celestial body and the visible horizon is directly related to the distance between the celestial body's GP and the observer's position. After some computations, referred to as sight reduction, this measurement is used to plot a line of position (LOP) on a navigational chart or plotting work sheet, the observer's position being somewhere on that line. (The LOP is actually a short segment of a very large circle on the earth which surrounds the GP of the observed celestial body. An observer located anywhere on the circumference of this circle on the earth, measuring the angle of the same celestial body above the horizon at that instant of time, would observe that body to be at the same angle above the horizon.) Sights on two celestial bodies give two such lines on the chart, intersecting at the observer's position (actually, the two circles would result in two points of intersection arising from sights on two stars described above, but one can be discarded since it will be far from the estimated position—see the figure at example below). Most navigators will use sights of three to five stars, if they're available, since that will result in only one common intersection and minimize the chance for error. That premise is the basis for the most commonly used method of celestial navigation, and is referred to as the 'altitude-intercept method'. There are several other methods of celestial navigation which will also provide position finding using sextant observations, such as the noon sight, and the more archaic lunar distance method. Joshua Slocum used the lunar distance method during the first ever recorded single-handed circumnavigation of the world. Unlike the altitude-intercept method, the noon sight and lunar distance methods do not require accurate knowledge of time. The altitude-intercept method of celestial navigation requires that the observer know exact Greenwich Mean Time (GMT) at the moment of his observation of the celestial body, to the second—since every four seconds that the time source (commonly a chronometer or in aircraft, an accurate "hack watch") is in error, the position will be off by approximately one nautical mile. An example illustrating the concept behind the intercept method for determining one’s position is shown to the right. (Two other common methods for determining one’s position using celestial navigation are the longitude by chronometer and ex-meridian methods.) In the adjacent image, the two circles on the map represent lines of position for the Sun and Moon at 1200 GMT on October 29, 2005. At this time, a navigator on a ship at sea measured the Moon to be 56 degrees above the horizon using a sextant. Ten minutes later, the Sun was observed to be 40 degrees above the horizon. Lines of position were then calculated and plotted for each of these observations. Since both the Sun and Moon were observed at their respective angles from the same location, the navigator would have to be located at one of the two locations where the circles cross. In this case the navigator is either located on the Atlantic Ocean, about 350 nautical miles (650 km) west of Madeira, or in South America, about 90 nautical miles (170 km) southwest of Asunción, Paraguay. In most cases, determining which of the two intersections is the correct one is obvious to the observer because they are often thousands of miles apart. As it is unlikely that the ship is sailing across South America, the position in the Atlantic is the correct one. Note that the lines of position in the figure are distorted because of the map’s projection; they would be circular if plotted on a globe. An observer in the Chaco point would see the Moon at the left of the Sun, and an observer in the Madeira point would see the Moon at the right of the Sun, and that whoever measured the two heights was likely to observe also this one bit of information. Accurate angle measurement evolved over the years. One simple method is to hold the hand above the horizon with one's arm stretched out. The width of the little finger is an angle just over 1.5 degrees elevation at extended arms length and can be used to estimate the elevation of the sun from the horizon plane and therefore estimate the time until sunset. The need for more accurate measurements led to the development of a number of increasingly accurate instruments, including the kamal, astrolabe, octant and sextant. 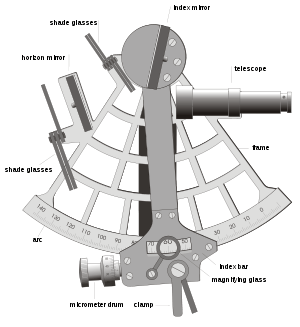 The sextant and octant are most accurate because they measure angles from the horizon, eliminating errors caused by the placement of an instrument's pointers, and because their dual mirror system cancels relative motions of the instrument, showing a steady view of the object and horizon. Navigators measure distance on the globe in degrees, arcminutes and arcseconds. A nautical mile is defined as 1852 meters, but is also (not accidentally) one minute of angle along a meridian on the Earth. Sextants can be read accurately to within 0.2 arcminutes. So the observer's position can be determined within (theoretically) 0.2 miles, about 400 yards (370 m). Most ocean navigators, shooting from a moving platform, can achieve a practical accuracy of 1.5 miles (2.8 km), enough to navigate safely when out of sight of land. Modern practical navigators usually use celestial navigation in combination with satellite navigation to correct a dead reckoning track, that is, a course estimated from a vessel's position, course and speed. Using multiple methods helps the navigator detect errors, and simplifies procedures. When used this way, a navigator will from time to time measure the sun's altitude with a sextant, then compare that with a precalculated altitude based on the exact time and estimated position of the observation. On the chart, one will use the straight edge of a plotter to mark each position line. If the position line shows one to be more than a few miles from the estimated position, one may take more observations to restart the dead-reckoning track. In the event of equipment or electrical failure, one can get to a port by simply taking sun lines a few times a day and advancing them by dead reckoning to get a crude running fix. Longitude can be measured in the same way. If one can accurately measure the angle to Polaris, a similar measurement to a star near the eastern or western horizons will provide the longitude. The problem is that the Earth turns 15 degrees per hour, making such measurements dependent on time. A measure a few minutes before or after the same measure the day before creates serious navigation errors. Before good chronometers were available, longitude measurements were based on the transit of the moon, or the positions of the moons of Jupiter. For the most part, these were too difficult to be used by anyone except professional astronomers. The invention of the modern chronometer by John Harrison in 1761 vastly simplified longitudinal calculation. Presently, lay person calculations of longitude can be made by noting the exact local time (leaving out any reference for Daylight Saving Time) when the sun is at its highest point in the sky. The calculation of noon can be made more easily and accurately with a small, exactly vertical rod driven into level ground—take the time reading when the shadow is pointing due north (in the northern hemisphere). Then take your local time reading and subtract it from GMT (Greenwich Mean Time) or the time in London, England. For example, a noon reading (1200 hours) near Central Canada or the U.S.A. would occur at approximately 6 pm (1800 hours) in London. The six-hour differential is 1/4 of a 24-hour day, or 90 degrees of a 360 degree circle (the Earth). The calculation can also be made by taking the number of hours (use decimals for fractions of an hour) multiplied by 15, the number of degrees in one hour. Either way, you can demonstrate that much of central USA or Canada is at or near 90 degrees West Longitude. Eastern longitudes can be determined by adding the local time to GMT, with similar calculations. The older method, called "lunar distances", was refined in the 18th century and employed with decreasing regularity at sea through the middle of the 19th century. It is only used today by sextant hobbyists and historians, but the method is theoretically sound, and can be used when a timepiece is not available or its accuracy is suspect during a long sea voyage. The navigator precisely measures the angle between the moon and the sun, or between the moon and one of several stars near the ecliptic. The observed angle must be corrected for the effects of refraction and parallax, like any celestial sight. To make this correction the navigator would measure the altitudes of the moon and sun (or star) at about the same time as the lunar distance angle. Only rough values for the altitudes were required. Then a calculation with logarithms or graphical tables requiring ten to fifteen minutes of work would convert the observed angle to a geocentric lunar distance. The navigator would compare the corrected angle against those listed in the almanac for every three hours of Greenwich time, and interpolate between those values to get the actual Greenwich time aboard ship. Knowing Greenwich time and comparing against local time from a common altitude sight, the navigator can work out his longitude. The considerably more popular method was (and still is) to use an accurate timepiece to directly measure the time of a sextant sight. The need for accurate navigation led to the development of progressively more accurate chronometers in the 18th century. (See John Harrison) Today, time is measured with a chronometer, a quartz watch, a shortwave radio time signal broadcast from an atomic clock, or the time displayed on a GPS. A quartz wristwatch normally keeps time within a half-second per day. If it is worn constantly, keeping it near body heat, its rate of drift can be measured with the radio, and by compensating for this drift, a navigator can keep time to better than a second per month. Traditionally, a navigator checked his chronometer from his sextant, at a geographic marker surveyed by a professional astronomer. This is now a rare skill, and most harbour masters cannot locate their harbour's marker. Traditionally, three chronometers were kept in gimbals in a dry room near the centre of the ship. They were used to set a hack watch for the actual sight, so that no chronometers were ever exposed to the wind and salt water on deck. Winding and comparing the chronometers was a crucial duty of the navigator. Even today, it is still logged daily in the ship's deck log and reported to the Captain prior to eight bells on the forenoon watch (shipboard noon). Navigators also set the ship's clocks and calendar. The celestial line of position concept was discovered in 1837 by Thomas Hubbard Sumner when, after one observation he computed and plotted his longitude at more than one trial latitude in his vicinity – and noticed that the positions lay along a line. Using this method with two bodies, navigators were finally able to cross two position lines and obtain their position – in effect determining both latitude and longitude. Later in the 19th century came the development of the modern (Marcq St. Hilaire) intercept method; with this method the body height and azimuth are calculated for a convenient trial position, and compared with the observed height. The difference in arcminutes is the nautical mile "intercept" distance that the position line needs to be shifted toward or away from the direction of the body's subpoint. (The intercept method uses the concept illustrated in the example in the “How it works” section above.) Two other methods of reducing sights are the longitude by chronometer and the ex-meridian method. While celestial navigation is becoming increasingly redundant with the advent of inexpensive and highly accurate satellite navigation receivers (GPS), it was used extensively in aviation until the 1960s, and marine navigation until quite recently. But since a prudent mariner never relies on any sole means of fixing his position, many national maritime authorities still require deck officers to show knowledge of celestial navigation in examinations, primarily as a back-up for electronic navigation. One of the most common current usages of celestial navigation aboard large merchant vessels is for compass calibration and error checking at sea when no terrestrial references are available. The United States Naval Academy announced that it was discontinuing its course on celestial navigation, considered to be one of its most demanding non-engineering courses, from the formal curriculum in the spring of 1998. It stated that a sextant is accurate to a three-mile (5 km) radius, while a satellite-linked computer can pinpoint a ship within 60 feet (18 m) as long as the satellites are functioning correctly. Midshipmen continued to learn to use the sextant, but instead of performing a tedious 22-step mathematical calculation to plot a ship's position, midshipmen feed the raw data into a computer. The US Naval Academy continued to practice celestial navigation for members of the USNA Varsity Offshore Sailing Team (VOST) and competes in the celestial spinnaker division in the bi-annual Marion-Bermuda Race racing aboard the venerable Navy 44 sail training craft. The Naval Academy Sailing Squadron (NASS) that consists of both the Offshore Sail Training Squadron (OSTS) and VOST crews use both long forms with paper plotting sheets and electronic celestial applications. Celestial navigation certification is required to achieve the highest "E" qualification at NASS. In October 2015, citing concerns about the reliability of GPS systems in the face of potential hostile hacking, the USNA reinstated instruction in celestial navigation in the 2015-2016 academic year. At another federal service academy, the US Merchant Marine Academy, there was no break in instruction in celestial navigation as it is required to pass the US Coast Guard License Exam. It is also taught at Harvard, most recently as Astronomy 2. Likewise, celestial navigation was used in commercial aviation up until the early part of the jet age; early Boeing 747s had a "sextant port" in the roof of the cockpit. It was only phased out in the 1960s with the advent of inertial navigation and doppler navigation systems, and today's satellite based systems which can locate the aircraft's position accurate to a 3-meter sphere with several updates per second. Celestial navigation continues to be taught to cadets during their training in the Merchant Navy and remains as a requirement for their certificate of competency. A variation on terrestrial celestial navigation was used to help orient the Apollo spacecraft en route to and from the Moon. To this day, space missions, such as the Mars Exploration Rover use star trackers to determine the attitude of the spacecraft. Intercontinental ballistic missiles use celestial navigation to check and correct their course (initially set using internal gyroscopes) while outside the Earth's atmosphere. The immunity to jamming signals is the main driver behind this apparently archaic technique. The United States Naval Academy resumed teaching celestial navigation in the 2015-2016 academic year, since it serves as a reliable backup to electronic methods which are susceptible to EMP, jamming, and computer malware. Celestial navigation trainers combine a simple flight simulator with a planetarium in order to train aircraft crews in celestial navigation. An early example is the Link Celestial Navigation Trainer, used in the Second World War. Housed in a 45 feet (14 m) high building, it featured a cockpit which accommodated a whole bomber crew (pilot, navigator and bombardier). The cockpit offered a full array of instruments which the pilot used to fly the simulated aeroplane. Fixed to a dome above the cockpit was an arrangement of lights, some collimated, simulating constellations from which the navigator determined the plane's position. The dome's movement simulated the changing positions of the stars with the passage of time and the movement of the plane around the earth. The navigator also received simulated radio signals from various positions on the ground. Below the cockpit moved "terrain plates" – large, movable aerial photographs of the land below, which gave the crew the impression of flight and enabled the bomber to practise lining up bombing targets. A team of operators sat at a control booth on the ground below the machine, from which they could simulate weather conditions such as wind or cloud. This team also tracked the aeroplane's position by moving a "crab" (a marker) on a paper map. The Link Celestial Navigation Trainer was developed in response to a request made by the Royal Air Force (RAF) in 1939. The RAF ordered 60 of these machines, and the first one was built in 1941. The RAF used only a few of these, leasing the rest back to the U.S., where eventually hundreds were in use. ↑ Clark, Pilita (17 April 2015). "The future of flying". Financial Times. Retrieved 19 April 2015. ↑ Peterson, Andrea (17 February 2016). "Why Naval Academy students are learning to sail by the stars for the first time in a decade". Washington Post. ↑ "World War II". A Brief History of Aircraft Flight Simulation. Retrieved January 27, 2005. ↑ "Corporal Tomisita "Tommye" Flemming-Kelly-U.S.M.C.-Celestial Navigation Trainer -1943/45". World War II Memories. Archived from the original on 2005-01-19. Retrieved January 27, 2005.